The map presented above was made in the continuity of the four previous ones that established an inventory of Paris Banlieues’ Cités (July 2014) and a cartographic alternative to our geographical imaginary of Paris (January 2015). This map consists in a simple graphic (and probably too approximate) exercise: tracing a rough 15-minute walking distance radius around each train station (Metro/RER/Regional train) of the “Greater Paris” — a notion only in formation at the administrative level. In such a centralized city, the connection to its center is fundamental in order to exercise a potential “right to the city.” As this map and the others show, the train lines are all oriented so to reach the center of Paris, which admittedly allows a more direct path to it; yet reinforces the pre-eminence of “fortified Paris” (see past article) to the detriment of banlieue-to-banlieue exchanges. A few tram lines allowing such displacements recently opened to support the bus system; yet, these vehicles are not comparable to the trains’ speed in any way. The access to the train system is thus crucial to the banlieues inhabitants (80% of metropolitan Paris) in their daily experience of the city — at least for the 5 million of them that do not own a car. In this regard, the 800,000 people who live in the cités that I mapped (in red on this specific map) occupy a particularly precarious situation where they either have to stay where they live — 24% of them are unemployed — or spend several hours a day in public transportation. As the map above show, about half of the cités are situated outside these 15-minute walk radiuses and therefore have to use a bus or a tram in order to reach the train network. Rather than describing at length theoretical daily lives experience, I would like to propose three examples of contrasts between the daily trip that someone needs to accomplish to go to work when living in one of the circles and one that does not. 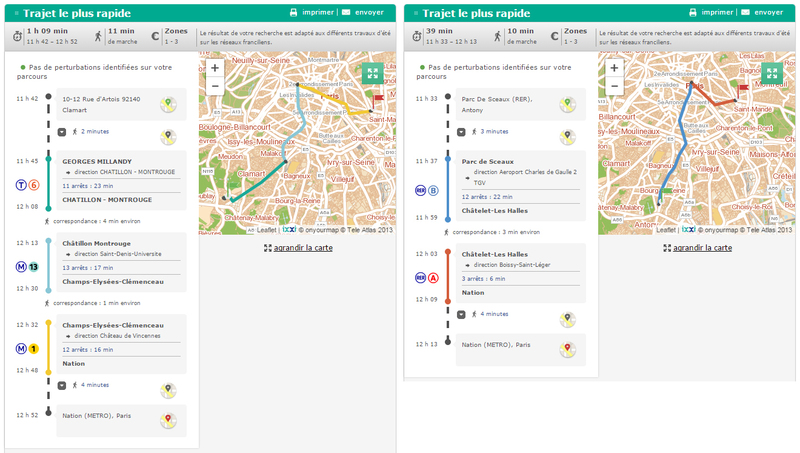 On the right here you can see the trip of a person who lives in the cité of Les Bergeries in Draveil (Essonne) and who has to go work in La Défense, Paris’s business district: in day time — people who clean the offices might have to take night buses, thus substantially extending the length of their commute — this person will take more than 2 hours to reach their work place, while a person living nearby (on the left) but closer to the train (RER) station will only take one hour to accomplish the same commute. 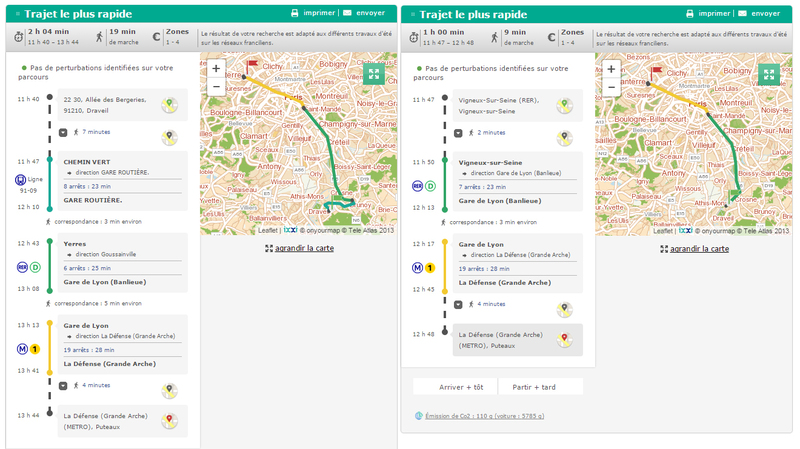 The contrast of the second example is less about time and more about convenience: a person living in the populated cité of Les Bosquets (30,000 inhabitants) in Clichy-sous-Bois (Seine St. Denis) will need to use four different means of transportation to go work at a hospital in Montrouge (immediate South suburb of Paris), while another living near the train (RER) station will only need to change once to reach the same destination. A cité like La Plaine in Clamart (Hauts de Seine) is not excessively far from the center of Paris from a geographical standpoint. Yet, it will take an hour and ten minutes for one of its inhabitants to reach the restaurant where they work in Nation, while it will only take 40 minutes for someone living in the richer town of Sceaux, closer to the train (RER), despite the same geographical distance. 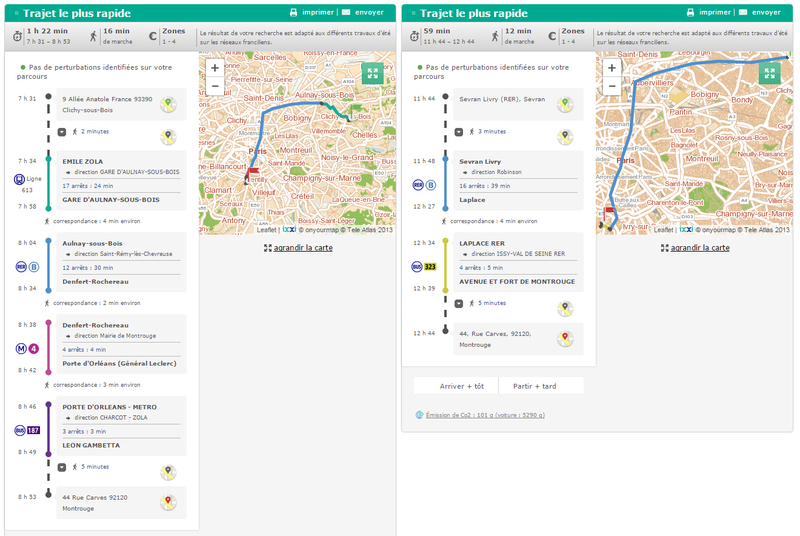 There could be many more examples, and they would deserve to come from actual experience from encountered people, rather than screenshots of the RATP (Paris’s public transportation company) website. We also ought to say that there are many cities in the world where a one hour, or one hour and half commute is relatively common. However, what is important to observe, beyond the absolute value of commuting time, is the difference of this time between a given city’s inhabitants. In the case of Paris, this difference is strong between people who live inside “Fortress Paris,” people in the Banlieues who are well connected with the public transportation network, and those who are not. Such a difference significantly increases the spatial segregation that is already at work through its urban and architectural condition.